When I received a Penn Museum summer internship, I was ecstatic to be back at the Museum. I had interned in the Archives last summer and had just been accepted to come back, this time to work on a project with the Museum’s Center for the Analysis of Archaeological Materials (CAAM) and ISEAA. I had a vague idea of what the project was from the description I received in my email, but I did not know much more beyond that I would be working with Thai plants that would be used for research. When I started my training with Dr. Chantel White, the CAAM archaeobotanist at the Museum, I finally began to understand what my project for the summer would be. I would be helping to curate plant specimens that Dr. Joyce White collected from the Ban Chiang region of Thailand between 1978 and 1981 for her PhD project. She was hoping to see how agriculture had evolved over history to give us the crops and farming techniques that are found in the area today. However, due to unforeseen circumstances, she was not able to finish the project the exact way she had planned, and for the last three plus decades, over 1,000 pressed and dried specimens have sat in a large shipping crate in her office. Research has been done on some parts of the collection, but the majority of the plants have been untouched. Dr. Chantel taught me how to mount the plants on herbarium paper and we discussed what should be included in the digital spreadsheet of information. I was so nervous about mounting the plants, especially because I had never done anything like it before. It seemed every plant I did, I had at least three questions about before I would even touch it. However, the more I did, the more confident I became with the work I was doing. About three weeks into my internship, I learned that I would be training another intern, Tracie, who was joining me since this project was pretty much under my management for the summer. All the nerves I thought I was getting over suddenly came back. The day before Tracie was to start, I went over all the notes I had from my training so that I was giving Tracie as much information as I could. I also wrote four pages of very specific questions to ask Dr. Chantel because she was leaving to do fieldwork in Greece and Jordan. 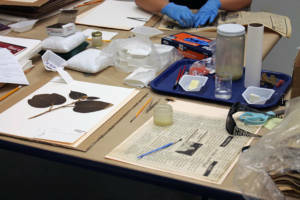 I wanted to be as prepared as possible for any issues that might come up because there would be no one at the Museum that I could turn to for questions relating to the mounting of the plant specimens. A botanical sample being mounted. Tracie and I had one issue though: how to describe what we were doing to other people. Whenever I talked to my friends about our internships, I could never find the right words to describe my project. What would I say? “I glue plants to paper.” That doesn’t sound professional and certainly doesn’t communicate the importance of the collection I was working on. It took me more than half the summer to develop an elevator-pitch that properly described this project as an important step in the management of this collection, rather than the craft project I had been projecting it to be. I was helping to curate the Ban Chiang Ethnobotanical Collection, and in doing so, helping to preserve plant material for future study and research.But all my worrying was for nothing. When Tracie started, she was hesitant about handling the plants and instead decided to work on typing Dr. Joyce’s field logs into our spreadsheet. She slowly began working with me mounting the botanical specimens, and built up her patience and confidence. We created near-identical work spaces and worked with (to us) surprising efficiency. By the end of our work this summer, we had mounted over 100 botanical specimens! In addition to caring for the pressed botanical specimens, I created a numerical code that each finished plant is labelled with, and organized the specimens so that they are easier to find. Tracie created a copy of the field log that could be given to Claire Elliot, a recent Penn graduate, to translate the Thai information and names. And together, we created a spreadsheet with detailed sections so that the data from the original notes could be separated and organized, and more accurate information about each specimen could be entered. Despite our hard work this summer, the project is in an early stage and hundreds more plant specimens will require processing. One of the steps that needs to be taken is to figure out how best to care for this collection. Dr. Jordan Teisher, the collections manager of the herbarium at the Drexel University’s Academy of Natural Sciences, was kind enough to show Dr. Joyce and me around the Academy’s botanical collection and give us information and tips about the proper curation of such collections. In the future, the mounted specimens could be examined by botanists, agronomists, and anthropologists to explore the biodiversity of the area surrounding Ban Chiang. Preserving this plant material could also lead to new research on DNA and botanical identification, since many of these species are local crops that are not widely grown. This collection is more than just a bunch of plants and paper; it is a trove of untapped ethnobotanical information and research potential. 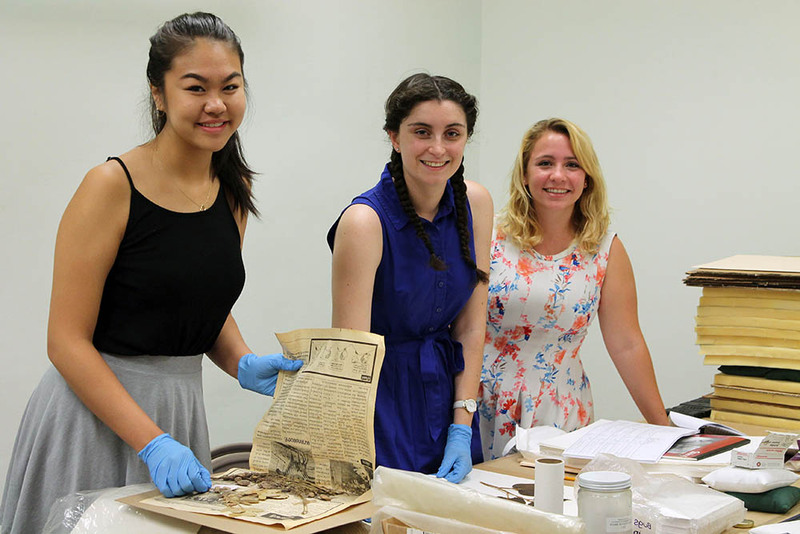 From left to right: Tracie Dinh, Antonia Love, and Claire Elliot working in room 167 of the Museum this past summer on the Ban Chiang Ethnobotanical Project.